The 1952 Summer Olympics (Finnish: Kesäolympialaiset 1952; Swedish: Olympiska sommarspelen 1952), officially known as the Games of the XV Olympiad, were an international multi-sport event held in Helsinki, Finland from July 19 to August 3, 1952. A soild blue background is intruded on its left side by a structure, shaded in white, representing the tower and stand of the Helsinki Olympic Stadium. The Olympic rings, also white, lie at the top of the blue background, partly obscured by the stadium's tower. 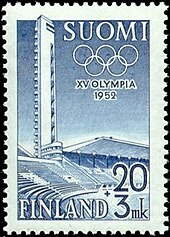 The word "1952" is written in white in the middle of the blue background, while "XV Olympia Helsinki" is written in blue, beneath the image. Helsinki had been earlier selected to host the 1940 Summer Olympics, which were cancelled due to World War II. It is the northernmost city at which a summer Olympic Games have been held. These were the first games to be held in a non-Indo-European language speaking country. It was also the Olympic Games at which the most number of world records were broken until surpassed by the 2008 Summer Olympics in Beijing. The Soviet Union, the People's Republic of China, Hong Kong, Indonesia, Israel, Thailand, and Saarland made their Olympic debuts in Helsinki 1952. Helsinki was chosen as the host city over bids from Amsterdam and five American cities at the 40th IOC Session on June 21, 1947, in Stockholm, Sweden. Minneapolis and Los Angeles finished tied for second in the final voting. These were the final Olympic Games organised under the IOC presidency of Sigfrid Edström. Israel made its Olympic debut. The Jewish state had been unable to participate in the 1948 Games because of its War of Independence. A previous Palestine Mandate team had boycotted the 1936 Games in protest of the Nazi regime. Indonesia made its Olympic debut with three athletes. The newly established People's Republic of China (PRC) participated in the Olympics for the first time, although only one swimmer (Wu Chuanyu) of its 40-member delegation arrived in time to take part in the official competition. The PRC would not return to the Summer Olympics until Los Angeles 1984. The Republic of China (Taiwan) withdrew from the Games on July 20, in protest of the IOC decision to allow athletes from the People's Republic of China to compete. For the first time, a team from the Soviet Union participated in the Olympics. The first gold medal for the USSR was won by Nina Romashkova in the women's discus throwing event. Only after I had felt a heavy golden circle in my hand, I realized what happened. I am the first Soviet Olympic Champion, you know, the first record-holder of the 15th Olympiad...Tears were stinging my eyes. How happy I was!... After her win at the 1952 Summer Olympics. The Soviets turned the athletic competition into a metaphor for political propaganda. The first meeting between the Soviet Union and Yugoslavia in football is still the most famous one. On the political level, the Soviet leader Joseph Stalin and the Yugoslav leader Josip Tito split in 1948, which resulted in Yugoslavia being excluded from the Communist Information Bureau. The origin of the conflict was Tito’s refusal to submit to Stalin’s interpretations and visions of politics and in process becoming a Soviet satellite state. Before the match, both Tito and Stalin sent telegrams to their national teams, which showed just how important it was for the two head of states. Yugoslavia led 5–1, but a Soviet comeback in the last 15 minutes resulted in a 5–5 draw. The match was replayed, Yugoslavia winning 3–1. The defeat to the archrivals hit Soviet football hard, and after just three games played in the season, CDKA Moscow, who had made up most of the USSR squad, was forced to withdraw from the league and later disbanded. Furthermore, Boris Arkadiev, who coached both USSR and CDKA, was stripped of his Merited Master of Sports of the USSR title. The Olympic Flame was lit by two Finnish heroes, runners Paavo Nurmi and Hannes Kolehmainen. 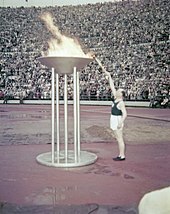 Nurmi first lit the cauldron inside the stadium, and later the flame was relayed to the stadium tower where Kolehmainen lit it. Only the flame in the tower was burning throughout the Olympics. Hungary's Golden Team won the football tournament, beating Yugoslavia 2–0 in the final. Germany and Japan were invited after being barred in 1948. Following the post-war occupation and partition, three German states had been established. Teams from the Federal Republic of Germany and the Saarland (which joined the FRG after 1955) participated; the German Democratic Republic (East Germany) was absent. Though they won 24 medals, the fifth-highest total at the Games, German competitors failed to win a gold medal for the only time. Rules in equestrianism now allowed non-military officers to compete, including women. Lis Hartel of Denmark became the first woman in the sport to win a medal. Emil Zátopek of Czechoslovakia won three gold medals in the 5000 m, 10,000 m and the Marathon (which he had never run before). Bob Mathias of the United States became the first Olympian to successfully defend his decathlon title with a total score of 7,887 points. Josy Barthel of Luxembourg pulled a major surprise by winning the 1500 m.
Eva Perón, the celebrated First Lady of Argentina, died of cancer in July 1952 while the Olympics were taking place, so a memorial was held at the Games for the Argentine team. The 1952 Summer Olympics featured 17 different sports encompassing 23 disciplines, and medals were awarded in 149 events. In the list below, the number of events in each discipline is noted in parentheses. With an annual average temperature of 5.9 °C, Helsinki is one of the coldest cities to have hosted the Summer Olympics. A total of 69 nations participated in these Games, up from 59 in the 1948 Games. Thirteen nations made their first Olympic appearance in 1952: The Bahamas, the People's Republic of China, Gold Coast (now Ghana), Guatemala, Hong Kong, Indonesia, Israel, Netherlands Antilles, Nigeria, Soviet Union (USSR), Thailand, and Vietnam. Japan and Germany were both reinstated and permitted to send athletes after being banned for 1948 for their instigation of World War II. Due to the division of Germany, German athletes from Saar entered a separate team for the only time. Only West Germany would provide athletes for the actual Germany team, since East Germany refused to participate in a joint German team. These are the top ten nations that won medals at the 1952 Games. The 50th anniversary of the Helsinki Olympic Games was the main motif for one of the first Finnish euro silver commemorative coins, the €10 silver coin minted in 2002. The reverse depicts part of the Helsinki Olympic Stadium, as well as a section of the 1952 500 markka coin. The obverse has lettering SUOMI FINLAND 10 EURO, a flame, and Finland is the only country highlighted on earth. ^ a b "Factsheet - Opening Ceremony of the Games of the Olympiad" (PDF) (Press release). International Olympic Committee. September 13, 2013. Archived (PDF) from the original on 14 August 2016. Retrieved 22 December 2018. ^ Bascomb, Neal (2005). The Perfect Mile: Three Athletes, One Goal, and Less Than Four Minutes to Achieve It. Mariner Books. ISBN 9780618562091. ^ "International Olympic Committee Vote History". 9 September 2013. Retrieved 24 February 2015. ^ "Past Olympic Host City Election Results". Games Bids. Retrieved 16 September 2015. ^ Mulvenney, Nick (7 August 2008). "Chen Chengda, China's almost Olympian". Reuters. Retrieved 16 September 2015. ^ "On This Day: 1952: 20 July: Zatopek wins gold at Helsinki". BBC News. Retrieved 16 September 2015. ^ "USSR – Yugoslavia, the Story of Two Different Football Conceptions". russianfootballnews.com. Retrieved November 27, 2017. ^ Marc Sollinger (February 6, 2014). "The 9 weirdest cities that have hosted the Olympics (and why!)". www.marketplace.org. ^ Byron, Lee; Cox, Amanda; Ericson, Matthew (4 August 2008). "A Map of Olympic Medals". The New York Times. Retrieved 24 February 2015. Wikimedia Commons has media related to 1952 Summer Olympics. "Helsinki 1952". Olympic.org. International Olympic Committee. "Results and Medalists — 1952 Summer Olympics". Olympic.org. International Olympic Committee.